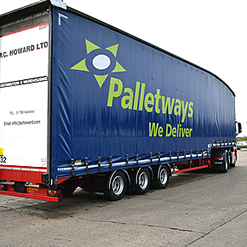 PC Howard Ltd is a member of the Palletways Network, which is the UK's and Europe's leading pallet network. The Palletways network is managed by Palletways (UK) Ltd, a Company that is part of the Palletways Group. In the UK Palletways comprises a central Hub at Lichfield ,with secondary hubs in Greenford, London, a Northern Hub in Leeds and a Scottish Hub. Members of the Palletways Network are allocated specific postcode areas and operate to a Code of Conduct, which is continually monitored by Palletways Central Management to ensure that the service offered across the whole net work is at a constant high level. The system operates on a Hub and Spoke basis, with members collecting palletised freight from their customers and then trunking it to their allocated hub where it is unloaded – in the manner of a giant sorting office. Once all the trunks are unloaded the process of reloading the trucks with palletised freight that will require to be delivered in each members own postcode area. The Trunkers then return to their depot with the Palletised freight which that members will be required to deliver. Once back at the depot the Pallets are unloaded and then reloaded on to ‘local’ collection and delivery vehicles for delivery in accordance with the originating customers instructions. The central feature of the Palletways Network is the systems that are in place to control and manage each pallet that is handled by the system to ensure that the pallets are delivered in accordance with the members wishes. The two key features of this are the Pallet Labelling system and the Palletway IT system .